Introducing the Most Cost Effective Way to Generate More Seller Leads Today. In this seller market, give homeowners what they want to know: the value of their home. Home Value Leads built an optimized landing page to convert clicks into home seller leads by capturing the potential sellers home and contact information. Start generating seller leads Today! Don't know if it will work for you? Try it for 14 days FREE! Built in drip email campaigns that can be used as-is or customized to your liking to nurture your listing leads until they are ready to sell. Studies have shown that listing leads respond better to text messaging than email. Now you can send automated text messages and convert those seller leads into transactions. Create virtually unlimited landing pages based on the lead's location to improve internet lead conversion. We provide additional contact information from your real estate leads to help you get in touch with them. Your Home Value Leads generation website landing page is optimized to capture real estate leads anywhere - Desktops, laptops, mobile phones, and tablets. Get notified instantly when you receive an internet lead via email and/or mobile phone text message. Quick follow up will increase real estate listings! Online lead capture tools! Manage, edit, or add leads right from your online administration page. Our private Facebook Mastermind group is packed full of high producing real estate agents & REALTORS®. Our clients are awesome and discuss best practices, conversion strategies, and new ideas. Instead of offering multiple options and pricing structures, we simply put all of our awesome features into a single package and slap a reasonable price tag on it. Show your contacts you mean business by sending an automated home value report, complete with their home value and neighborhood comparables - updated every month. Just Show Me The Demo! We provide real estate lead generation tools and training to help agents generate sellers leads that become listings. Home Value Leads offers optimized lead generation for real estate agents using lead capture websites to grow home listing pipelines. We continually test all aspects of our lead websites to ensure high conversion rates at the lowest cost per lead. New features are added regularly to enhance the experience of prime seller prospects and listing agents. We go above and beyond when it comes to training you and customer service because if you aren't successful, we aren't successful. We continually poll our subscribers regarding feature requests, suggestions, and feedback because we care about making a product that you will love, is easy to use, and WORKS. While some services out there provide incorrect Zestimate data or other inaccurate systems, Home Value Leads searched for the most accurate systems & software applications available to make our agents look sharper and more knowledgeable. We don't just sell home value websites. We provide a complete system with step by step guides for seller lead generation techniques and conversion optimization. Don't get left in the dark after purchase. Amazing customer service and very responsive, even at off business hours! My business has doubled due to HVL and I'm grateful to have found them!! Got a listing a week ago and two more this week. Been using for about 3 months. It's a process people, work them right and you'll convert. Show Me A Sample Lead! We've developed an amazing system to walk you through setup, internet lead generation, and lead nurturing. The number one question should be "Where do I sign up?" but here are some answers to other questions you may have. Current pricing for Home Value Leads is $74.99 per month once your 14 day free trial is over. There are no contracts, no setup fees, and no hidden fees. How good are the leads that are generated? A lead is only as good as the real estate agent who works it. Agents follow up with leads the same way they would with a prospect they met at an open house, or a call from a lead generation website. We turn search engine clicks into valuable leads, and the real estate agent turns these prime seller leads into listings. Do I get to keep my leads when I leave? If you cancel (you won't want to), you can export your leads and take them with you. We never contact your leads or sell them to anyone else. Ever. How does Home Value Leads help me generate Home seller leads? 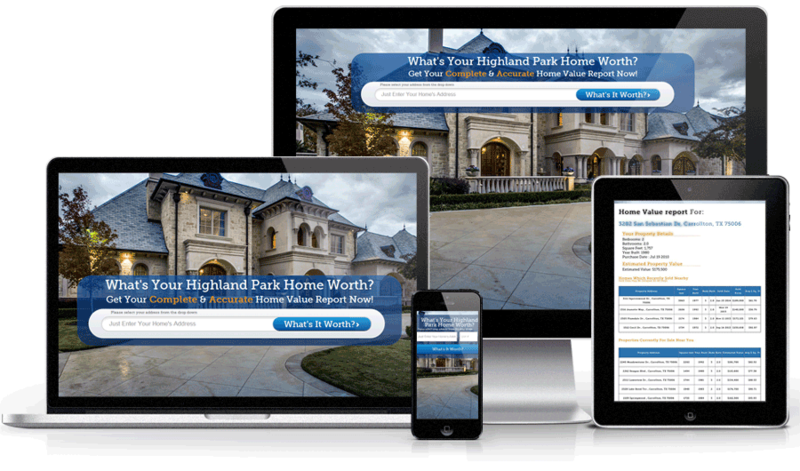 Home Value Leads offers innovative home value websites optimized to turn clicks into listings at a ridiculous rate. All you have to do is drive online traffic to the website, which we can help with! Can You Generate Real Estate Seller Leads For Me? We make the system as easy as possible to use. However, if you don't want the hassle of doing it yourself, we can manage your site and your ads for you so that all you have to concentrate on is turning your leads into listings. Do you give leads to multiple agents? Absolutely not! Leads generated on your site are YOUR leads - agents cannot buy leads from us. Connect With Prospects. Anytime, Anywhere, Any Device. We created Home Value Leads to be user friendly and as simple as possible. How simple? We'll show you how to generate the best seller leads tomorrow! Start My 14 Day Trial Now!